Rising Star Lodge #4 AF&AM Senior Warden Thomas Allen presents a scholarship check to Cub Scout Pack 83 Committee Chairman Chad Cukierski at the annual Hancock Scouting District Awards Dinner held on Thursday, April 11. Cub Scout Pack 83, serving boys and girls from Penobscot, Castine, Brooksville, and Orland, was recently awarded a scholarship from the Masons of Penobscot Rising Star Lodge #4 AF&AM. Each summer, local Cub Scouts have the opportunity to attend a week-long residential summer camp at the Roosevelt Scout Reservation in Eddington. This program is specially tailored for older Cub Scouts and Webelos, serving as a transitional experience for them prior to joining the BSA scouting program, according to a news release. A shorter, three-day camp program is available each summer for younger Cub Scouts at the Craig Brook Hatchery in Orland. Some of the activities held at the camp give Cub Scouts an opportunity to earn achievements toward their rank advancement, while other activities are for fun and enjoyment of the outdoors. Thomas Allen and Ben Moss represented Rising Sun Lodge at Katahdin Area Council’s Hancock District awards dinner, held Thursday, April 11. 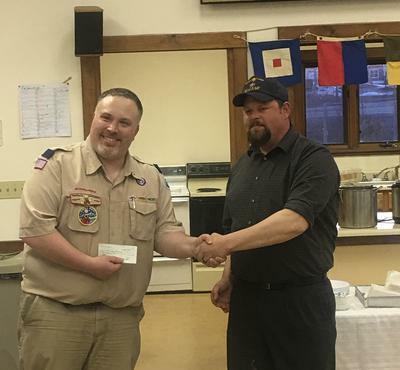 The scholarship money provided will help to ensure that all Cub Scouts from Pack 83 will have the opportunity to participate in a significant summer camping experience.